As a part of the success tour , Kalyana Vaibhogame team visited Priyadarshini Degree & PG college, Khammam and National institute of technology (NIT) , Warangal .. Hero Naga Shourya referring the students spoke few valuable words as they shouldn't neglect their studies to enter into their specified fields of interest to reach their goals and fulfill the dreams of their parents The welcome was so warming and had fun with the students celebrating at their College Annual Day function as said by the team. 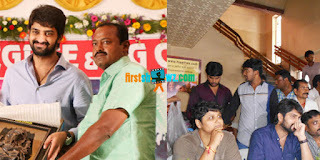 Then after they reached .Shakunthala Theatre , Vijayawada and a theatre in guntur ..
Director BV Nandini Reddy referring the movie success told they made the film with intense passion and the result is so amazing... the movie is grabbing both the youth and familiy audience attension which is not possible for a movie these days ..
Gemini Suresh quoted few punch lines which the audience enjoyed a lot...Finaly they expressed their happiness regarding the response from the audience and movie doing very well at all the centres.